well for him it might be a toughie. i mean if he was born into it and raised around it then you feel bad but if he made the decision to do that then thats his problem i dont really feel bad for him. The kid wasnt even old enough to legally get a job...I wanted to give him money, but I knew what he would spend it on...especially that late. i never give anybody any money. like bums i wont. the worst one i saw the other day was at a busy intersection there ws a family member on every center median asking for money for a single 24 yo mom. like really? no way in hell would i give money to people like that. and to make it worse they were leaning into the street holding thier signs almost hitting cars as they were driving by. 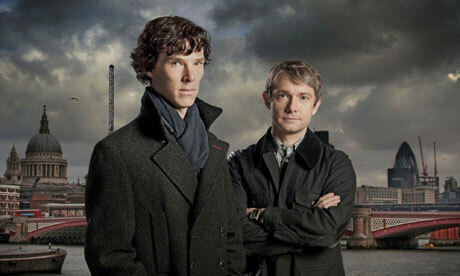 A new show called Sherlock. Except on this one, "dr" watson is an army veteran. Sherlock Holmes acts a bit like a genious Dr Who, and the police hates him, but need him so desperately.